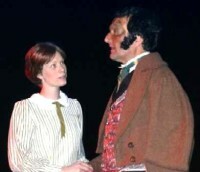 Why do these Bronte girls always go for such grumpy men? They'd have a much jollier time of it if they'd aim for someone a bit less intense. someone like Bertie Wooster, say. Of course, Bertie wouldn't really stand a chance with Jane, and not just because Charlotte hadn't thought him up, but because she wanted her heroine to be both good and to undergo noble suffering. These things are tricky on stage, however: they can easily appear dull. Polly Bissett overcame the problem brilliantly in Colin Lawrence's highly enjoyable production at the ADC. Hers was an admirably still and patient performance, unshowy but honest, and her happiness on winning the love of Rochester was the more convincing because of it. 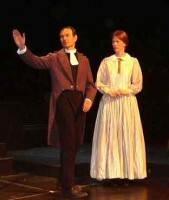 She was well matched by a strong and authoritative Rochester in Martin Woodruff. He revealed not only the sadness of the man but also his integrity. The lighter moments between these two were particularly well done, I thought. 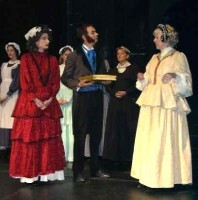 Every member of a large cast gave valuable support. Gabrielle Theunissen was composed as the young Jane. Brenda Cottis and her brood of irksome toffs impressed. (Why did Rochester even flirt with the possibility of having this woman as a mother-in-law?) Graham Waterhouse (the choc scoffing toff) then took a step down the social ladder to reappear convincingly as the worthy Rivers, a man with one of the best chat-up lines in literature: 'God intended you to become the wife of a missionary.' And, if Rochester had been Bertie Wooster, Sally Marsh as Mrs Fairfax would have made an admirable Jeeves. Here was a woman who, with a word, could stop dogs barking in a distant room. Hugh Mellor relished his sanctimonious outbursts as Brocklehurst; Stephanie Waller was chilling in the small but vital role of the first Mrs Rochester; and Mandi Cattell and Samantha Gamble did well as Grace Poole and the chatty Leah. But everyone had his or her moment and helped to keep the narrative spinning. The use of narrators worked less well to my mind. I don't object to there being narrators, these big stories often need them, but I found it puzzling that they all spoke as if they were Jane Eyre. (Switching to the third person might have helped: we could have accepted that.) After a while it began to look like that scene in Spartacus where the slaves all jump up and claim to be Kirk Douglas. This was not the fault of the narrators themselves who spoke well and with conviction, but the device brought a stutter to an otherwise excellently paced production. 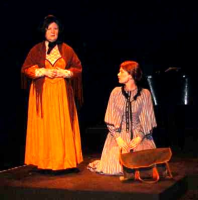 An aptly bleak set by Carole Sammon created the right atmosphere, and changes were swift and efficient. (I particularly enjoyed the way the bed was whipped off.) The set also gave Ed Hopkins opportunities to light imaginatively and these he took. Sheila Pierre's costumes looked good against the dark backgrounds. Particular praise is due to Graham Potter who provided an outstanding soundscape. This was a big, sprawling play that needed the effort, talent and co-operation of many people under an astute and steady hand. The warm response of the audience was just one indication that that's exactly what it got from Bawds.